The Passover meal is a yearly Jewish tradition that holds a great deal of religious significance. The story of Passover is told in Exodus, the second book of the Torah. It describes how during the Biblical time of the Ten Plagues, on the night of the Tenth Plague, God spared the Israelites from suffering. According to Exodus, God told Moses to sacrifice a lamb and mark all Israelite family doors with the lamb's blood. On the night of the Tenth Plague, the "Angel of Death" killed every family's firstborn male child, but "passed over" the firstborn male children of the Israelites. Pharaoh Ramses II's son was killed during this plague and as a result, he ordered all the Israelites out of Egypt that night, freeing them from slavery. The eight days of Passover and the Passover meal are observed in order to honor the Exodus of the Israelites from Egypt. What Are the Passover Bitter Herbs? How Do Jewish People Celebrate Passover? The Passover meal, also called the Passover Seder, is conducted on the fist night of the eight days and is sometimes held for two nights, the first and second. The Passover meal is full of religiously symbolic rituals and food choices. 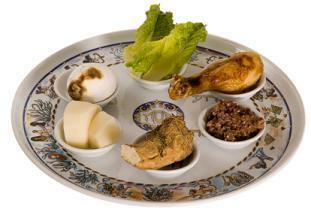 The Passover meal table includes very specific items, each with a significant meaning. Candles - At the beginning of the Passover Seder, candles are lit before saying a prayer. A k'arah - The k'arah is a special dish in which all the traditional Passover foods are placed. Small bowls of salt water - These bowls are used for dipping the karpas or vegetables during the Passover meal. Wine glasses - Wine is consumed four times during the Passover meal. Traditionally, a different wine glass is used each time. The Cup of Elijah - This cup is set in honor of the Prophet Elijah. A Matzah plate - This covered plate contains three matzahs. Bitter herbs (moror) - Traditionally, ground horseradish root is used. The bitterness of the herbs is symbolic of the hardships the Jews suffered while enslaved. Romaine lettuce (chazeret) - The root of this lettuce is bitter and also represents the bitter lives of ancestral Jews. Roasted shank bone (zeroah) - This symbolizes the sacrificial lamb from the traditional account of the first Passover. Eggs (bietzah) - Eggs are said to be the food of mourners. They symbolize the historical offering of the Jews at the Temple of Jerusalem. Eggs are also a symbol of sacrifice, life and rebirth. Vegetables or greens (karpas) - Usually parsley or celery, these greens are dipped into the bowls of salt water and eaten as a symbol of the tears shed by the enslaved Jewish ancestors. Charoset - This sweet paste made of apples, nuts, cinnamon and kosher red wine symbolizes the mortar used by enslaved Jews during the construction of various buildings in Eqypt. Recite the Kiddush - This blessing is recited over wine at the beginning of the Passover Seder, and the first glass of wine is consumed. Wash hands - This is done without reciting a blessing and symbolizes the Purity Laws of the ancestral Jewish Temple. Eat the Karpas - These vegetables are dipped in salt water and then eaten. The vegetables are symbolic of the meager meals eaten by enslaved Jews and the salt water represents their tears. Break the middle matzah - The middle matzah is broken and one half is placed back on the Seder plate, while the other half is placed in a bag or napkin and hidden for the Afikoman search at the conclusion of the meal. Retell the story of the Exodus - A second glass of wine is poured and a guest tells the story of the holiday's origins. Once the story is completed, the second glass of wine is consumed and a blessing is recited. Wash hands - Everyone washes their hands again before continuing on with the Passover meal. Bless the matzah - A blessing is said over each piece of matzah, including the broken one. Eat the bitter herbs alone. Eat the bitter herbs along with a piece of matzah. Serve the full Passover meal - The foods served for this meal vary from family to family and can include anything from matzah ball soup to mushroom lasagna. Search for the Afikoman - The children search for the Afikoman and once it is found, it is returned to the table, broken up and eaten. Recite grace - At the end of the Passover Seder, all those present say grace and consume the third cup of wine. The cup of Elijah is also filled with wine at this time. Sing songs - These are referred to as Hallel. During the singing, the fourth cup of wine is consumed. Reflect - This time is referred to as Nirtzah; everyone reflects upon Passover and its meaning.